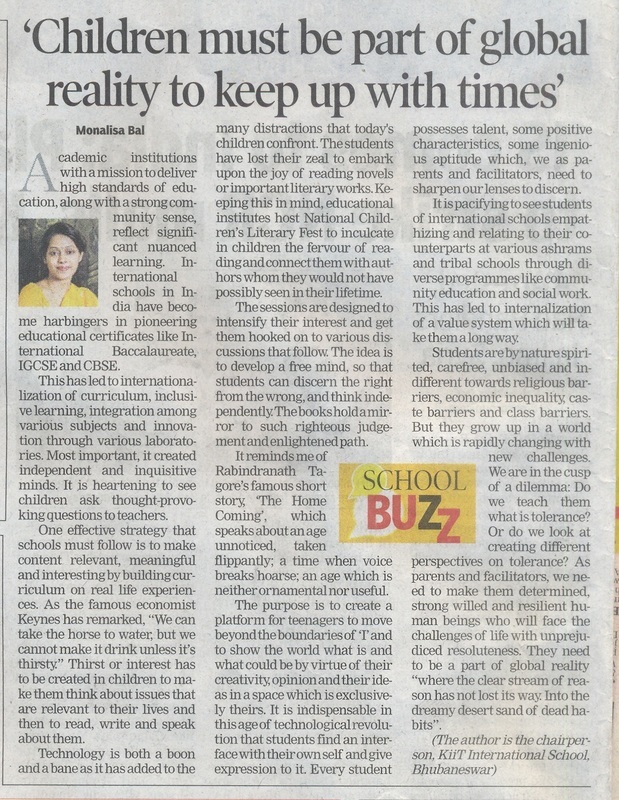 Sagarika Ghosh’s article in Times of India, 1st May, 2015 is an extremely riveting and alluring read compelling us to cogitate the fact whether India will ever get its Melinda Gates! The article speaks about big corporate honchos and their photo-ops bestowing philanthropy with a strong emphasis on ostentatious consumption. It is equally enlightening to learn about Sam Singh who gave up his high flying career to start a school in his village. Well the question is how many of us know someone called Dr. Samanta, who hails from a small village in Odisha, is not taught values and ideologies in a convent environment, does not hold a bank account but runs the world’s largest tribal school providing free education, food, residence and vocational education with a job guaranteed. In this context, Kalinga Institute of Social Sciences (KISS), a sister concern to KIIT, a private organization, housing thousands of students free of cost, free education could bridge the gender equity gap with a thrust towards social inclusion; is a living testimony to the model envisioned by Dr. Samant way back in 1993. This has mainstreamed the tribal students without gender disparity (58:42) representation of boys to girls with a credible opportunity to realize their dreams. The story of Kalinga Institute of Social Sciences was born after three decades of independence; thanks to the unwavering effort of its founder, as envisioned by the founding fathers under Article 15 and 16 which guarantees equality of opportunity to all sections of society in terms of access to education and employment opportunity. Home to nearly 25000 students with 3000 seats reserved in KIIT University, the institution runs with a slim budget of around Rs.75crore of which Rs.25 crore comes through donation from staffs and officers of KIIT University and rest through philanthropy and financial aid. The primary objective is to provide holistic education to the marginalized tribal students who would otherwise be caught up in the perplexity of illiteracy, impoverishment and would be prone to mindless violence. There is a difference between philanthropy driven by wealth and philanthropy driven by vision and commitment. Our nation boasts of Varrier Elwins and Ambedkars. The movement towards social inclusion has been envisaged through the directive principles of our constitution. The last decade has witnessed significant policy changes for financial inclusion through social sector programmes like MNREGA, ICDS, SSA and MDM. However asymmetry in access to education and social & economic empowerment has been a distressing factor in India’s development story particularly in respect to tribal community. In this neo liberal era where market mechanism has given way to crony capitalism, where families dominate business wealth and philanthropy is limited to CSR initiatives, corporate commitment to communities who are marginalized and vulnerable is few and far between. As Martin Luther King Jr. had said "Human progress is neither inevitable nor automatic”. The Kalinga Institute for Social Sciences has paved the way for unbelievable progress and development of tribal students, under the mentor ship of its founder who is carrying forward the legacy of ‘genuine love’ and ‘true simplicity’ of Varrier Elwins. We need to look for the Melinda Gates amongst us. As the redoubtable poet Tagore had said, “I looked around the world for beauty little realizing to look at the drop of dew glistering on a blade of grass outside my home”. Chairman of of KiiT International School: one of the leading international school in eastern India.